It is always worse somewhere. The NY Times reported on China’s “vast army of college graduates seeking professional jobs.” Gordon Chang tells the sad story of 1,100 Chinese college grads applying for 8 jobs shoveling human waste, or “night soil.” Sometimes it seems like the prospects for illustrators are just a bleak. 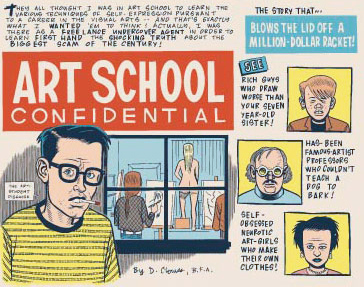 Art School Confidential, opening panels © Daniel Clowes, B.F.A. Years ago, Prof. Cunfer and I went to a conference at the Society of Illustrators in NYC. Representatives from big city schools known for illustration, –Parsons, Pratt, and my alma mater, SVA, spoke about the job prospects for young illustrators. Murray Tinkleman, the moderator, asked each prof to honestly estimate what percentage of their recent illustration grads were making a living as illustrators. The highest estimate was 5%. Kutztown Communication Design illustration grads are highly skilled and most find work in a related field. The key word in that statement is related. The pool of talented young illustrators grows, but demand is, at best, stagnant. Not long ago, every city the size of Allentown had its own newspaper editorial cartoonist. Many big city papers had multiple staff artists. Those days are gone. Newspapers are dying, and survivors settle for inexpensive syndicated editorial cartoons. These cartoons, naturally, focus on national stories, so state and local stories don’t get the attention they deserve. The well-rounded illustrator will survive. I always advise illustration majors to take upper-level graphic design or web design classes. It is still quite possible to land a graphics design position that will permit you to do some illustration. If you have drawing skills you can save your boss, or yourself, time and money. The other option for illustrators remains creating one’s own material. In this regard, face it, we not that different from “fine artists.” Take the image above, for example. Originally, cartoonist Daniel Clowes drew Art School Confidential as four-page story for his indie comic, “8-Ball.” I remember the day I first saw the original art for those pages hanging at Exit Art in New York. Those four simple pages struck a nerve, and the story became viral. 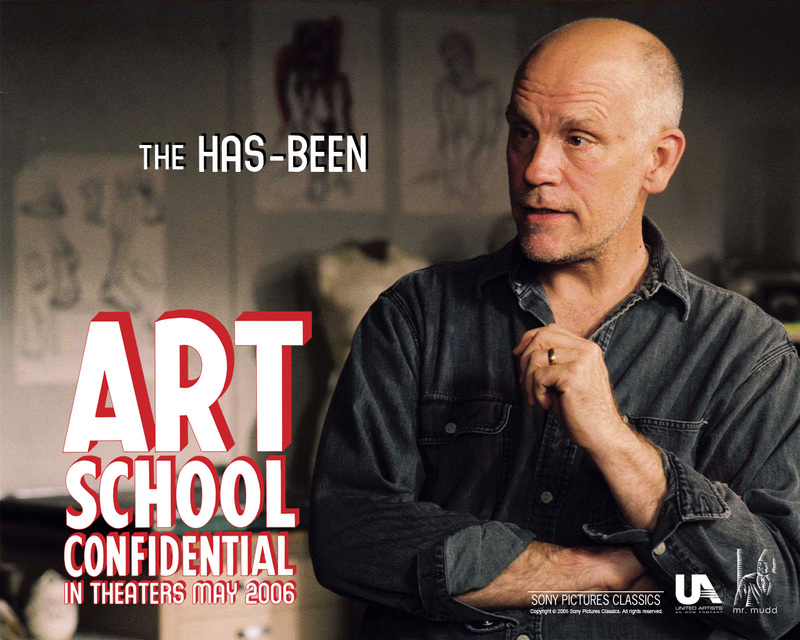 Eventually it became a movie starring Anjelica Houston and John Malkovich. Truth be told, the movie wasn’t half as funny as the comic, but the point is this: Nobody I know has the money or ability to make a Hollywood movie, but many illustration students have the ability to single-handedly create a four-page comic. I don’t mean to diminish Daniel Clowes’ considerable talent. His well-deserved success is the result of years of work at the drawing board. Illustrators with guts and ideas can self-publish their best ideas on paper or the web. Who knows what might be the next big thing? There are some obvious blockbuster movies based on superhero comics: Spiderman, Superman, Iron Man, etc. There are also many fine films that owe part of their genesis to the fevered imagination of an illustrator, including: Road to Perdition, V for Vendetta, American Splendor, Men in Black, and Unbreakable. Next > Incoming!! Chris Dacre: WAR is FUN! I agree that, in this day and age, illustrators need to tell their own stories. There is so little work out there for us. Some book cover work, video game concept art and other niche things still exist, but it’s few and far between.